There are many different websites you can use to find and book hotels around the world, but oftentimes the options can be overwhelming and it’s hard to know what is best. Based on our experience, though, if you want to find great hotels at great prices in Southeast Asia, the option with the most listings and best prices is Agoda. They are, by far, the biggest hotel booking operators in this region. Best of all, Agoda has a price match guarantee, which means that they’ll refund the difference in price if you book a room with them, and then find the same room for less on another website. Below we’ll walk you through not only how to sign up with Agoda but also some pro travel tips to help you find the best hotels at the best prices. The first thing you should do is register your details on the Agoda website and sign up to their newsletter, as this means you’ll earn points towards future books and also great great insider deals that are only available to people that are registered with them. You receive points when you book a room and also when you review a hotel that you’ve stayed at. This can mean a few dollars saved on the cost of the room. 500 points = $1. You need a minimum of 12,500 ($25) before you can redeem them. We’ve booked a few free rooms with the points we’ve earned. For this example, I’ll search for a hotel in Hue, Vietnam for two nights from 15 June 2016. The initial hotel results that are returned are shown in the screenshot below. The things to note here are that the hotels shown are sorted in Agoda Recommended order. These hotels are usually among the most expensive, and often aren’t even the ones with the best reviews. I’m not sure what Agoda Recommended means, but personally I’d prefer to book hotels that guests have rated highly. The hotels shown in the initial search will also include all price ranges. So, the first things I do are to change the sort order to Review Score, select what hotel facilities I want (usually only internet), and enter the Price (per night) that I want to pay – this is found on the right hand side of the screen. For this example I’m going to set Price (per night) to $20. The updated search results will then look similar to the screenshot below. One thing I don’t like about Agoda, is that these prices don’t include taxes, so often the final price can be significantly higher, but you don’t get to see this price until you’re near the end of the booking. So bear this in mind when you’re searching for a hotel within your price range. How much the taxes are depends on the country the hotel is in. If you click a hotel from the search results, you’ll see that the price includes a statement along the line of… Not included in room price: Service charges 5%, Hotel tax 10%. So in this case you need to add 15% to the price that’s quoted. In this example, I considered the top hotel (Holiday Diamond Hotel), but when I clicked through it showed that you had to pay extra for the internet, so I gave it a miss. The next hotel on the list, Than Thien Friendly Hotel, was the one we actually booked, and it turned out to be an excellent choice. At this stage I usually look through the first few hotels and check out the locations. You want a great hotel in a great location, not a great hotel that’s miles from where you want to be. So at this stage it’s important to make sure the hotel is near all the places you want to visit. If I can, I try to book a hotel that has a score in the Fantastic range. This should ensure that the hotel is pretty good. Once I’ve made a decision, I usually also check the reviews for the hotel at tripadvisor.com, just to double check that all is ok. On our travels so far, we haven’t had any major disappointments when booking hotels this way. In fact, most of our bookings have been pretty good. 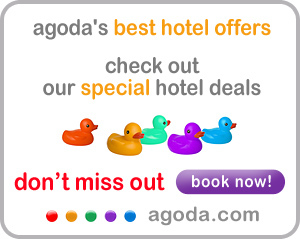 To book a hotel via Agoda, just click on the link below. Please note that we may get a very small commission if you book a hotel via Agoda using any of the links on this page. But also note that we only recommend Agoda because we use them personally and are very happy with the service. We wouldn’t recommend a company that didn’t provide us with great service.